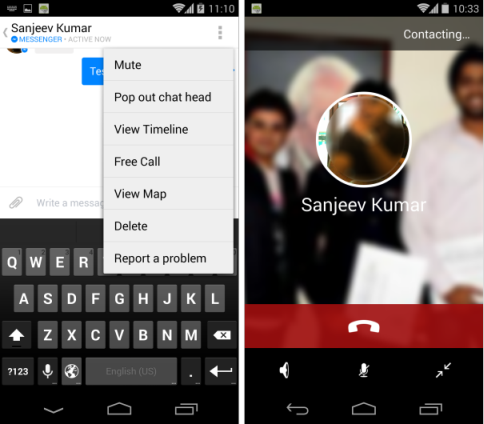 Facebook has launched the voice calling feature for its Messenger app for Android and iOS back in March 2013. And the feature was available only for selective countries including US and Canada and etc. Now Facebook Messenger app updated with free voice calls support in India and you can call your friends and relatives easily with this app. There are many free calling apps available but Facebook has a wide network of our friends and relatives connectivity, so you can find friends easily and call them with a click. The free voice calling feature will use your internet data plan and it doesn’t use your phone talk time. To use this feature, you need a 3G connection or Wi-Fi connection to get clear voice without problems. How to use Free Call Feature in Facebook Messenger? Check your friends list to see who are currently online. Click the particular user that you want to call and go to chat screen. You can call friends from chat heads and you can use speaker too. You can use this feature only those who are using same Facebook messenger app and the option disabled when your friends are using Facebook for Web. If that “Free Call” option is in grey color, you cannot call to that person. After the ending of the call, Facebook will ask to rate the quality of the call to improve its performance. Facebook Messenger’s free call feature is similar to Viber free calls. Facebook will be gradually rolling out this feature globally soon. The feature is not available in Facebook Messenger for Windows Phones that was launched recently.